I’m Erin, product manager at Cognitive ToyBox, and I am delighted to announce the release of our new parent product, First Choice Assessment! I am a former teacher and math tutor, and I just completed my Masters of Arts in Digital Media Design for Learning at NYU. I am thrilled to be putting both my teaching and technology experience and skills to good use. First Choice Assessment helps children get ready for kindergarten through weekly, five minute, game-based assessments. The app is appropriate for children 3-5 years of age. As we designed First Choice Assessment, we spoke with dozens of parents, teachers and children to better understand their needs. We heard about the anxiety that parents face when preparing their students for preschool and kindergarten programs in NYC. We also heard about the importance of app engagement, but also the fear of too much screen time for their little one. That’s why we have designed First Choice Assessment to be a technology product designed to enhance school readiness outside of the screen. Parents and children use First Choice Assessment together for five minutes per week to assess kindergarten readiness skills in critical developmental domains like math, language, literacy, and social-emotional learning. The app then aggregates the data into weekly reports that provides you - the parent - with teacher-approved practice activities that take families off the iPad and into the real world. ​So if your child is not able to complete tasks in connecting numerals with quantities, you can play a game called Secret Agent to help them practice! ​Check out First Choice Assessment on the App Store today and tell us what you think! The Cooney Center at Sesame Workshop shared the story behind the research and development of our newest app, Fuzzy Numbers: Pre-K Number Foundation. Check out the blog post here! Research has long shown that math whizzes tend to have a stronger intuitive sense of quantity, or “number sense” (Halberda et al., 2008). Our games aim to improve your child's number sense, so he or she will have a leg up at learning math in school. In the lab, four and five year old children who played digital number sense games demonstrated better math performance (on tests of counting, number identification, addition, etc.) compared to control groups, when tested right after a brief practice (Wang et al., 2016) or after several weeks of practice (Park et al., 2016). We are excited to release More 4 Monkey 2.0, which was inspired by this 2016 research. The app guides children through seven activities in approximate quantity, addition, and subtraction. The app is adaptive and continually challenges your child’s number sense. Children from ages 2 to 6 enjoy playing More 4 Monkey. We hope you enjoy this new version of More 4 Monkey, which provides a much richer set of activities for your child, as well as a parent dashboard for you to keep track of progress. Halberda, J., Mazzocco, M. M., & Feigenson, L. (2008). Individual differences in non-verbal number acuity correlate with maths achievement. Nature, 455(7213), 665-668. Park, J., Bermudez, V., Roberts, R. C., & Brannon, E. M. (2016). Non-symbolic approximate arithmetic training improves math performance in preschoolers. Journal of Experimental Child Psychology, 152, 278-293. The American Academy of Pediatrics’ new screen time guidelines have renewed conversations regarding the topic. How much of the discussion is rooted in research? We review the findings around screen time and early childhood development, helping you make educated decisions regarding your child. The static nature of TV is not conducive for learning. ​Most research on screen time has been conducted with TV. The consensus from researchers is that TV is not beneficial for early learning, but TV is not representative of all types of screen time. Toddlers learn best in contingent environments — that is, environments that provide feedback based on a toddler’s action. TVs do not wait for a child to process information or respond to a question, leaving them without the type of feedback they need for learning. Most previous research has conflated TV with “screen time,” but reactive screens that provide feedback have potential to change the debate. For example, researchers have shown that toddlers can learn vocabulary words equally well from a virtual Skype session on a computer screen as they would through an in-person interaction (Roseberry et al., 2014). Where does this leave touchscreen technologies, which are flexible enough to provide contingent feedback based on responses? Touchscreen technology has the potential to change the debate. Research with touchscreen devices is limited but promising. A 2016 study demonstrated that 4-6 year olds were able to apply logic puzzle strategies learned from an app in 2D to a real life 3D model (Huber, 2016). Furthermore, there has been some research indicating that apps like Bedtime Math may help promote children’s math achievement (Berkowitz, 2015). Ultimately, more research is needed to provide definitive recommendations. In the meanwhile, parents may relieve themselves of some screen time guilt, if their child is using a tablet or smartphone rather than watching TV. Be cognizant of their toddler’s touchscreen activities. Not every touchscreen experience provides a rich learning experience. For example, using a touchscreen as a mini-television with YouTube and NetFlix videos is likely not better than TV. 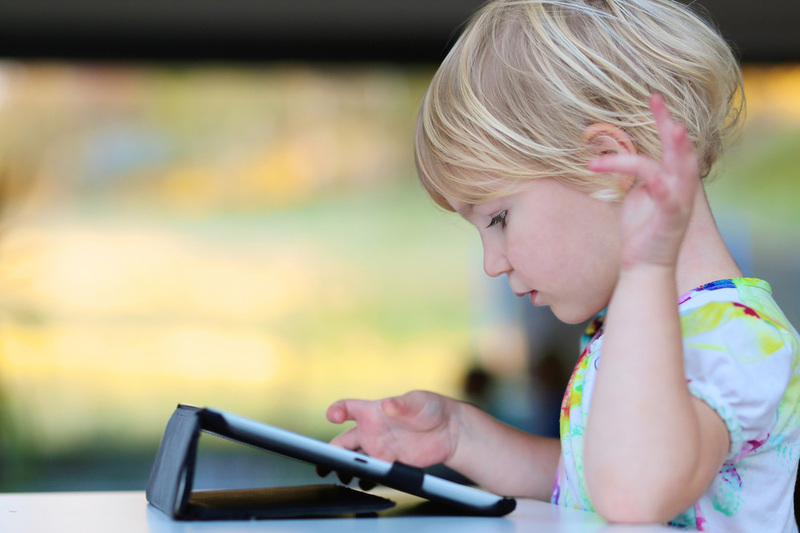 However, if you take the time to choose apps with high quality content, your child may have the opportunity to learn while engaging with the touchscreen. Berkowitz, Talia, et al. "Math at home adds up to achievement in school." Science 350.6257 (2015): 196-198. Huber, Brittany, et al. "Young children's transfer of learning from a touchscreen device." Computers in Human Behavior 56 (2016): 56-64. Roseberry, Sarah, Kathy Hirsh‐Pasek, and Roberta M. Golinkoff. "Skype me! 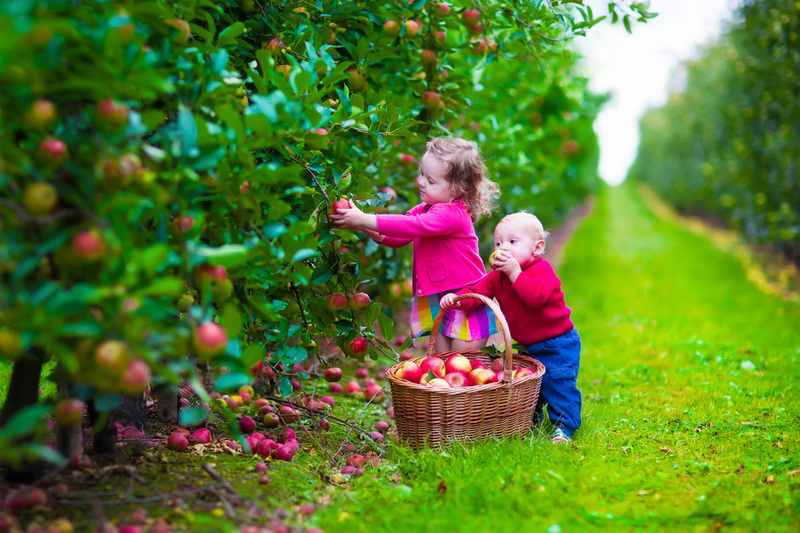 Socially contingent interactions help toddlers learn language." Child Development 85.3 (2014): 956-970. We recently released our first app, First Words Checklist. 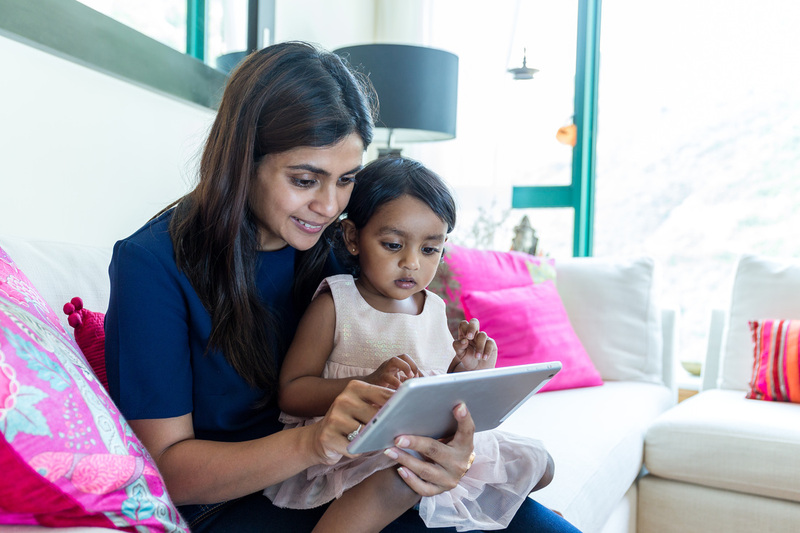 The app is an informal vocabulary assessment on the iPad to help parents and early childhood teachers to better understand how a toddler or pre-k aged child’s language is developing. Why assess language development? Children may develop at different rates, but all will eventually speak their native tongue. However, early language skills span beyond communication: language is the foundation on which learning is based. After all, without language, how can you learn new concepts, understand logic puzzles, or solve word problems? Early language experiences have long-term impacts. A recent study showed that a larger oral vocabulary measured as early as 24 months predicts later achievement in reading, math, and behavioral functioning three years later at kindergarten entry (Morgan et al., 2015). Moreover, school readiness at kindergarten entry is a major predictor of later reading and math achievement (Duncan et al., 2007), and kindergarten test scores correlate with later outcomes such as earnings at age 27, college attendance, homeownership and retirement savings (Chetty et al., 2010). As a parent, how can you ensure that you are best supporting your toddler’s learning and development? One way is through informal at-home assessments. Early childhood assessments sometimes get a bad rap because parents don’t want to subject their child to test taking so early. But there are ways to assess your toddler’s language in a non-threatening, engaging manner. Assessments can also take the form of observational notes regarding social/behavioral, cognitive, and motor development domains. Informal assessment apps, like First Words Checklist, are helpful for a number of reasons. First, they can help your toddler prepare for iPad-based assessments, like the AABL or Kindergarten School Readiness Test (KRT/SRT), which are required for admission to some of NYC’s top private schools. Assessments can also help pinpoint your child’s strengths and weaknesses and serve as a starting point to guide future educational activities. With vocabulary acquisition, parents can also track development over time, to see how many words their child has acquired from month to month. Finally, at-home assessments enable parents to provide more precise information to a child’s pediatrician, caregivers, and teachers. Chetty, R., Friedman, J. N., Hilger, N., Saez, E., Schanzenbach, D. W., & Yagan, D. (2010). How does your kindergarten classroom affect your earnings? Evidence from Project STAR (No. w16381). National Bureau of Economic Research. ​Duncan, G. J., Dowsett, C. J., Claessens, A., Magnuson, K., Huston, A. C., Klebanov, P., ... & Japel, C. (2007). School readiness and later achievement. Developmental psychology, 43(6), 1428. Morgan, P. L., Farkas, G., Hillemeier, M. M., Hammer, C. S., & Maczuga, S. (2015). 24-Month-Old Children With Larger Oral Vocabularies Display Greater Academic and Behavioral Functioning at Kindergarten Entry. Child Development. 86(5), 1351-1370.